All rooms and hotel spaces are smoke-free. Occupy the kids for hours in our beautifully renovated Atrium with a basketball court, badminton, ping pong, lounge area and arcade. Heated crystal blue salt water pool with two giant water slides. Water park operates seasonally. This King Room is accessible from the main floor of the hotel. It is equipped with a pillow top bed, fridge, microwave and Keurig coffee brewer. This Queen Room is accessible from the main floor of the hotel. It is equipped with a pillow top bed, fridge, microwave and Keurig coffee brewer. 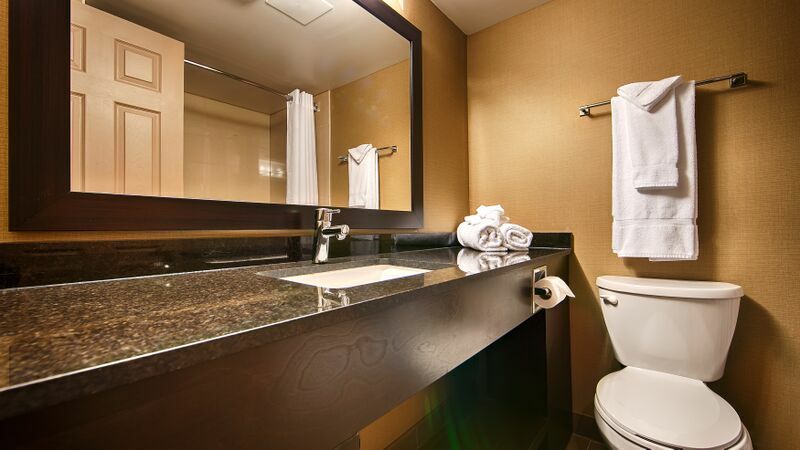 This King/Queen Family Suite is equipped with pillow top beds, fridge, microwave and Keurig coffee brewer. 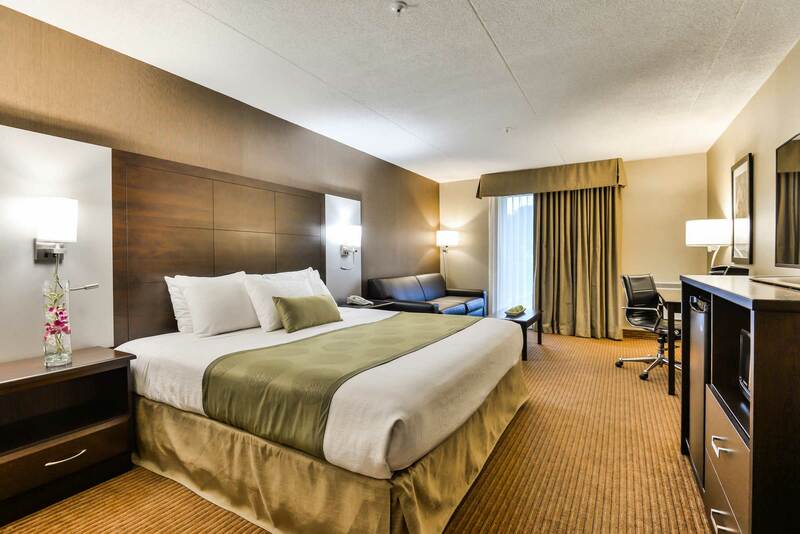 This King Room has no elevator access but is equipped with a pillow top bed, fridge, microwave and Keurig coffee brewer. This Queen Room is accessible from the main floor of the hotel. It is equipped with a pillow top bed, fridge, microwave and Keurig coffee brewer. From this room, guests also have access to the Atrium. This Queen Room has elevator access and is facing the Atrium. 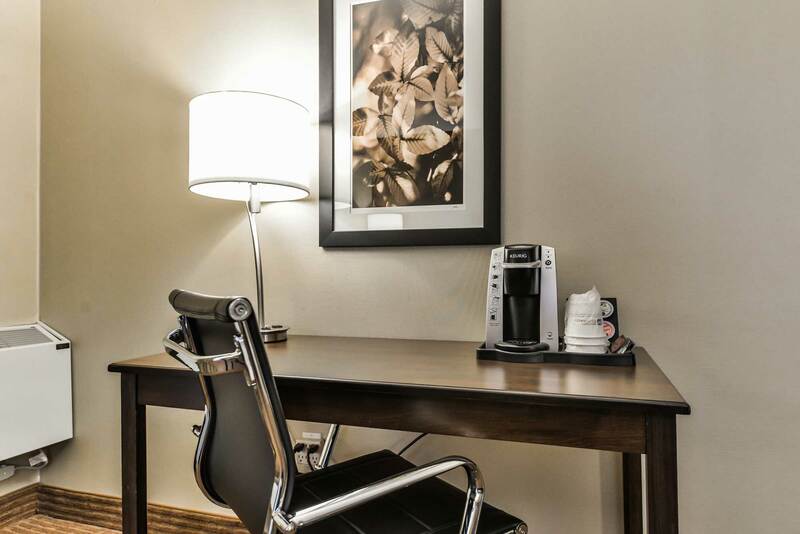 The room is equipped with a pillow top bed, fridge, microwave and Keurig coffee brewer. This Queen Room has no elevator access. It is equipped with a pillow top bed, fridge, microwave and Keurig coffee brewer. This King Room has elevator access and has a balcony facing outdoors. It is equipped with a pillow top bed, fridge, microwave and Keurig coffee brewer. 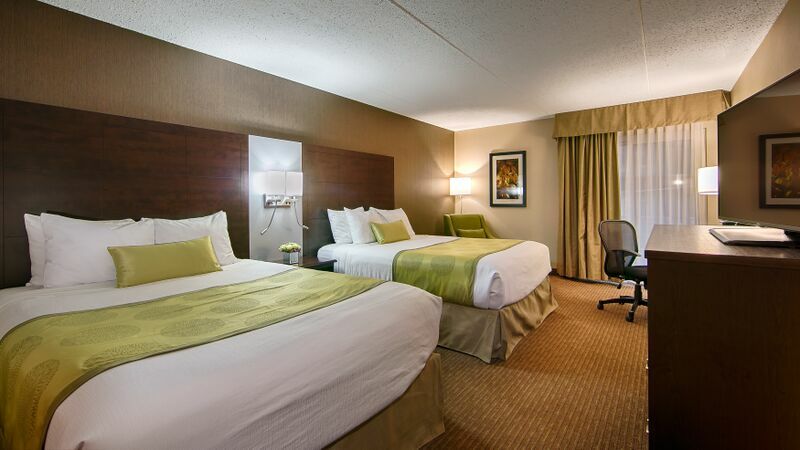 This King Room is located on the main floor of the hotel and has patio doors with access to the outside. It is equipped with a pillow top bed, fridge, microwave and Keurig coffee brewer. This King Bed Suite comes with a large living space. It is also equipped with a pillow top bed, fridge, microwave, shower stall and Keurig coffee brewer. 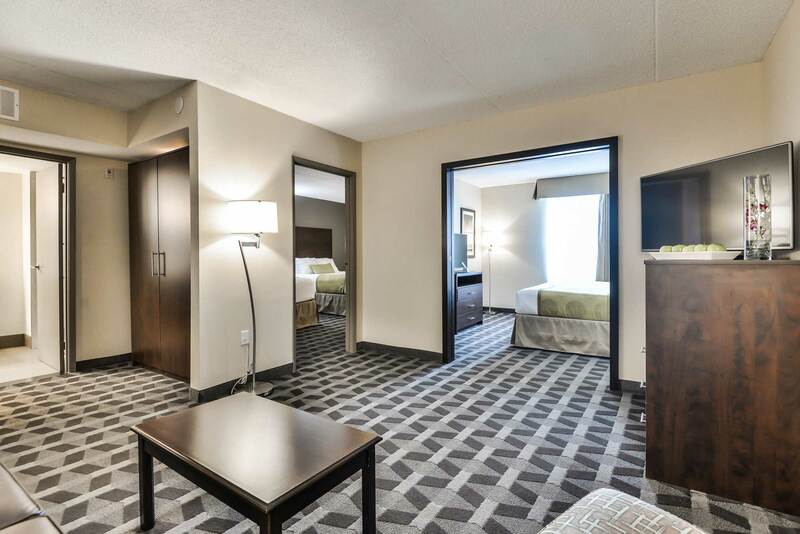 This King Room is located on the main floor of the hotel, is pet-friendly and has patio doors with access to the outside. It is equipped with a pillow top bed, fridge, microwave and Keurig coffee brewer. This Queen Room is located on the main floor of the hotel and is pet-friendly. It is equipped with a pillow top bed, fridge, microwave and Keurig coffee brewer. This Queen Room has elevator access and has a balcony, It is equipped with a pillow top bed, fridge, microwave and Keurig coffee maker. This Queen Room is located on the main floor of the hotel and has a patio door with access to the outside. It is equipped with a pillow top bed, fridge, microwave and Keurig coffee maker. This was our first time in Canada, after a hard board crossing and another local hotel messed up our booking. We landed at this Best Western. Worn out and not very happy we checked in, but the staff turned this trip right around for us. They were over the top friendly and helpful. They took time to explain everything to us and really made us feel welcome. 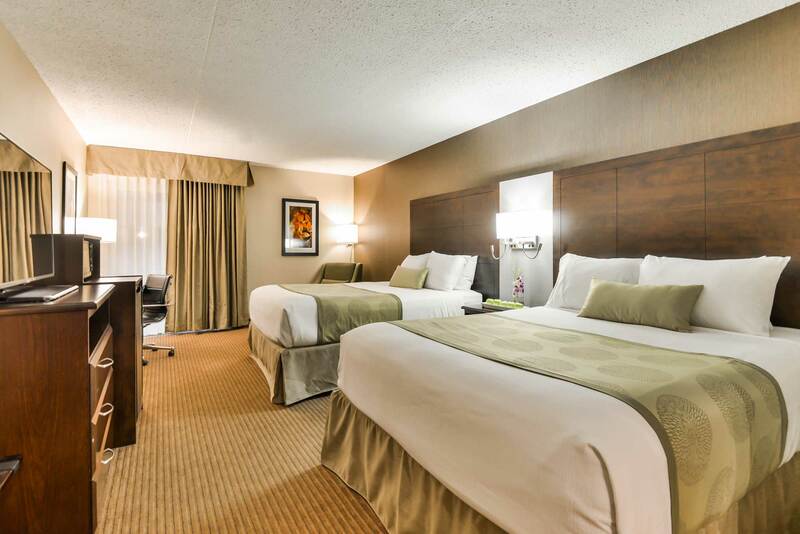 Modern amenities, great location, comfortable rooms, excellent fresh breakfast, helpful staff! More geared towards families as there are sporting facilities not found in other hotels - including a badminton court (which is pretty unique). Looks like a nice place to hold a reception/wedding too! Really close to Point Pelee National Park and some great fish places! Highly recommended! We rarely stay in Best Westerns due to the really great difference from one to the other. In other words, we never know what to expect; sometimes really nice, the next time pretty average. This BW was ranked by TripAdvisor as Leamington's best hotel, so we opted for it on our road trip through Ontario. It was nice and we enjoyed our stay. The rooms were spacious and spotless. The hall and rooms--because of the colors--were less attractive than say, a Hampton Inn or Hilton Garden Inn, but certainly not depressing. Agreat place to relax and enjoy life in all it's variety, especially Birds. the area is full of things to do, the locale people are very very nice. A place to visit many times. I would go back there any time. Great amenities in suite (fridge, microwave, Keurig, large flat screen TV) as well as in the hotel (huge play area with full size badminton court, ping-pong tables, smaller snooker tables, 1/2 basketball court, video/arcade games, air hockey, huge slide & climbing station for kids + workout room with cardio machines & weights) + water park + restaurant), and water & coffee available for free in lobby area. LCBO has everything. Warsteiner in a can?? Wow. Amazing breakfast!! Try the bird seed bread!!! King's Chicken - great new addition to the menu! Enjoying natural beauty with dawn to dusk life cycle. Beaches are really amazing and also bike trails. What a wonderful family run restaurant! Food and service was excellent. And if you have room for dessert, you can go next door to there ice cream shop for a hard ice cream cone. To die for! Drink the coffee. It's good. Make it a meal and EAT FRESH! Tim Horton's also sells Tim's brand coffee by the can. It's so beautiful! They bright nature back to that place. Sehr sehr groß. Qualität passt zu einem Supermarkt. Mennonite and Mexican food in one restaurant. This Store has something for everyone and the price s are hard to march anywhere.